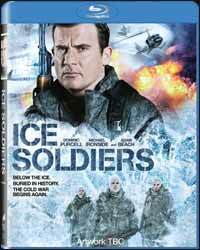 Ice Soldiers (2013 - 1 hr, 35 min, 21 sec) is a Canadian action/thriller, directed by Sturla Gunnarsson and staring Dominic Purcell. The script was written by Jonathan Tydor. What should have been a rip roaring ride - it even has Michael Ironside in it for god’s sake - turns out to be more of a damp squib. The basic problem with the film is the Soviet soldiers. Supposedly stronger, faster and more violent than their adversaries, they come with a few shortcomings which bled a lot of the thrill from the story. For a start, when they are revived, presumably having hibernated in the ice, they set about killing everyone around them, with the overall plan of heading away from the frozen wastes to the warmer climes of America, to fulfil their mission of killing all three hundred million Americans, presumably one at a time. Whatever you can say about these guys they certainly show patience, even if they miss the fact that more people would be born, which makes their mission never-ending. Secondly, the guys are tall and blond enough to make a Nazi wet his pants, which of course means they stand out like a sore thumb in and company of average people, not exactly the best disguise going. Lastly, I think the film needed something along the lines of three terminators, a real threat, which seems unstoppable, even though we know the hero will win the day. Strong they may be, but they die just as easily as any other person. The threat level kinda reduces to three guys who are easily spotted that you just have to shoot. The script hits every beat that you would expect and the actors do what they can with this, but that’s just another issue, the beats never surprise. In fact there is nothing in the film which would surprise an audience. It’s well shot with some good direction, but there is so much here that has been seen before and done better that the overall experience is surprisingly dull and lacking tension. As a Blu-ray it looks great, the snowy wasteland is captured in all its fragile beauty and the DTS HD MA audio track is suitably loud. Unfortunately the story is the weak link which lets the whole film down. The disc contains no extras.